THE KEY TO SUCCESS. FOR THE GOOD OF OUR EMPLOYEES. A company is only as strong as its employees. This is also true for Brau Union Österreich. We employ more than 2,300 people. They are the ones ­responsible for brewing, marketing, selling and delivering our beer. Brau Union Österreich is very conscious of our responsibility to our employees. In addition to a salary, in many cases, we also offer various incentives, additional training options and health programs within the framework of collective bargaining contract. A centralized board of union employees along with union representatives at each brewing facility serves as employee advocates in business, social, health and cultural matters. We categorically reject all forms of discrimination and strive to promote diversity and equal opportunity. We observe several important guidelines in our daily operations – such as the ­“Employees and Human Rights” policy of the HEINEKEN family of businesses, which is based on the fundamental guidelines of the International Labour Organisation (ILO) (see www.ilo.org). We rely on our annual survey of Brau Union Österreich employees, known as the “Climate Survey” to measure how satisfied our employees are and to identify which areas still require improvement. 83% of all employees participated in the survey in 2016. An impressive 90% of those surveyed reported that they are ­satisfied with their employer and communicate this to the public with pride. Especially as a responsible producer of alcoholic beverages, the responsible consumption of alcohol is a very high priority for our company – for the public as well as for our employees. Since 2007, Brau Union Österreich has had an internal alcohol policy in place regarding alcohol consumption in the workplace. Along with providing company rules and information, we also offer assistance for employees with alcohol problems. Adherence to the rules is continuously monitored. Other activities such as the annual “Enjoy Responsibly Day” are also part of what we do as a company to educate our employees about the responsible consumption of alcohol – for the good of our employees and their families. Strategy-oriented, sustainable, demanding and supportive. Brau Union Österreich actively promotes training and education for all of its employees. In 2016, each employee received an average of 16.3 hours of continuing education or vocational training. At Brau Union Österreich, we have always placed a strong emphasis on the vocational training and education of our trainees. This is reflected in the high rate of job placement for our trainees in permanent positions, the number of successful candidates completing their training and the good reputation our trainees enjoy on the job market. In 2016, we were able to offer vocational trainee positions to 40 applicants, who were then placed under the capable supervision of 50 staff members, who are certified to train vocational students. In addition, every year we hold a two-day training session for vocational trainees. The top goal of this “academy” is to support our young employees in developing social and personal competence. Depending on which training year they are in, different topics are presented. Brau Union Österreich was awarded the ineo quality certificate in 2016 for its high vocational training standards. Primary focal points in personnel and organizational development in 2016. The ability of a company to implement strategies and flexibly adapt to change is largely dependent on its structure. “How can we formulate strategic goals based on organizational requirements?” This is one of the central questions that concern us. Our goal is to initiate and actively drive processes of change under the direct involvement of our managers in the role of “challenger” as well as “sparring partner”. Knowledge and the corresponding behavior are key factors for success in order to do good work. As the basis for building knowledge, Brau Union Österreich relies on the HEINEKEN learning philosophy (70/20/10): 70% “on the job”, 20% “near the job” (e.g. through work on interdepartmental projects) and 10% “off the job” (seminars, professional conferences, educational courses). Our behavioral guidelines are rooted in the HEINEKEN code of conduct. The development of senior managers and qualified junior managers is a special focus at Brau Union Österreich. We offer a series of development courses for managers, also within the framework of the HEINEKEN group. Identifying engaged, talented individuals and fostering their development in a systematic fashion guarantees that we will have the best team today and in the future. By promoting promising employees, we can exploit potential within the company and improve planning for individual succession. We guarantee occupational safety and health. Our business success is inherently linked to the well-being and motivation of our employees. Through projects such as “Fit on the Job”, we can help prepare our employees both physically and psychologically to perform their work with satisfaction and motivation. Safety programs help ensure that daily operations progress smoothly. 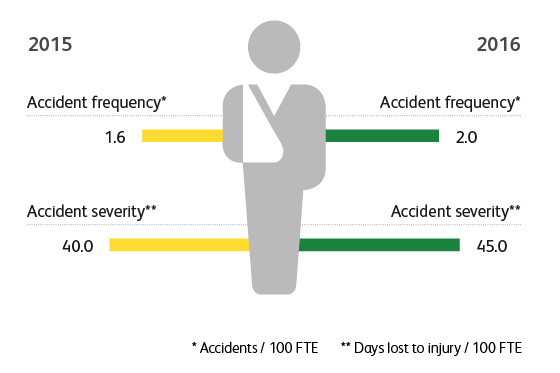 Our foremost goal is to reduce the number of accidents on the job to zero at all of our facilities and thus to minimize days lost to absenteeism. 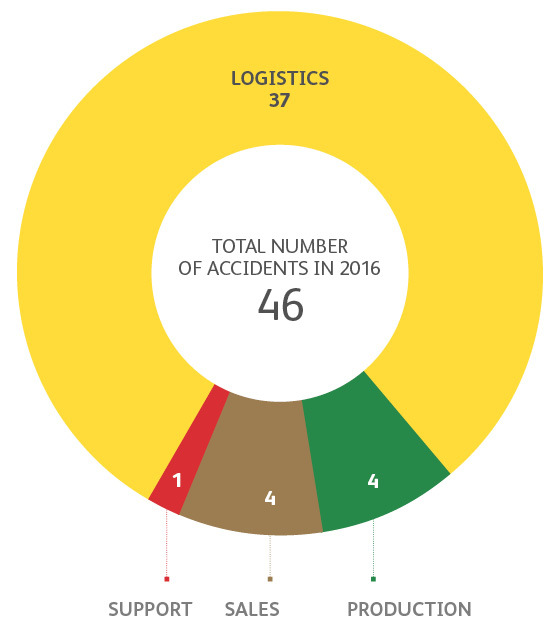 During 2016, there were no deadly accidents at the company, but 46 accidents did occur (including minor and severe injuries). All managers are responsible for occupational health and safety and receive support from our own SHE (Safety, Health & Environment) committee. Compliance with all rules and guidelines is monitored by regular walkthroughs at each site. Every year, we introduce projects focused on specific target areas within the company. In 2016, emphasis was placed on “Safety in Secondary Distribution”. Observations by supervisors relating to safety make it easier to identify the source of accidents and to implement measures to prevent accidents in the future. Furthermore, we have renewed our efforts to strengthen safety in production areas and in logistics. Safety tests were conducted continuously on machines used in production. A uniform set of documentation for contractors/service vendors was introduced. Special focus was placed on “Safety in Secondary Distribution”. “Road Safety Officers” were assigned: Each Safety Officer is responsible for 50 vehicles. Healthy management: Recognition of the impact of management on health; make managers and supervisors aware of its relevance as well as provide education and support. Healthy workplace: Assessment of mental and physical stress in the workplace is carried out. The fitness and health of our employees are important to us. Since 2005, we have raised awareness of occupational health among our employees with the project “Fit on the Job”. This program encompasses a comprehensive package of measures and is at the center of activities that make us attractive as an employer. At each of the Brau Union ­Österreich locations, there is a “Fit on the Job” liaison as well as health and safety specialists, all of whom are in constant contact with their fellow employees. It is a major challenge to return to work after a serious illness. The reintegration management process at our company supports employees as they navigate this difficult phase. This enables the company to offer early, targeted support measures tailored to the needs of the employee for successful reintegration in the workplace. Based on the results of the employee survey along with an evaluation of the physical impact of the job on our delivery truck drivers, promoting health in the truck fleet was made a SHE priority for 2016/17. In order to decide on reasonable measures based on the feedback we received, we invited delivery truck drivers from all regions, internal occupational health officers, safety coordinators and a kinesiologist to attend a workshop. We examined all of the processes required in a day’s work as a delivery truck driver – from adjusting the seat to loading empty cases to be returned to the brewery. After gathering this information and evaluating it critically, we developed a set of instructions on how the work can be carried out more safely and in a manner that is better for employee health. The results of the workshop are evident: The instructions have been captured as a video. Current and future delivery truck drivers can benefit from the information and tips from fellow coworkers in addition to learning exercises for stretching and warming up – all from the comfort of their home. We are planning further activities in the area of occupational health and safety in 2017. 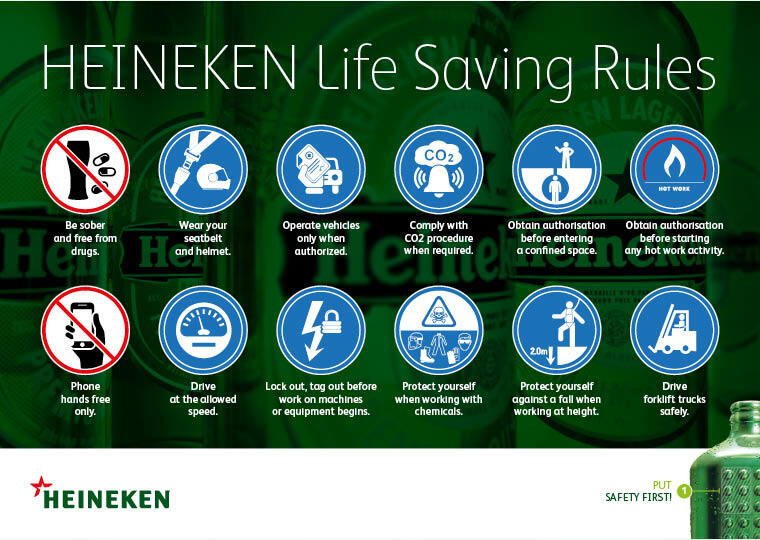 Our goal is to place more emphasis on communicating and teaching our “HEINEKEN Life Saving Rules” – a rulebook on occupational safety. Ongoing work safety courses addressing “loading and unloading trucks safely” should increase the safety of our employees in the transport department. In addition, we will integrate an information section on safety and health on our internal knowledge platform “ONE2Learn” and offer training courses through e-learning. A new safety position is planned within the existing organizational structure. Joining the Health and Safety managers are two regional safety coordinators as well as a Health and Safety specialist, who will be assigned to each brewery, in order for the team to work on safety issues on-site and to carry out projects for improving safety.